(WINDSOR, ON) – The usual suspects were named starters for the Express in their Friday night tilt with the Kitchener-Waterloo Titans in Windsor. Head coach Bill Jones is determined to move up in the standings rather than coast into the playoffs. The game also marked the fist time Kitchener came to town under the tutelage of Cavelle Johnson, and the return of former Express mainstay Darren Duncan. Windsor quickly built up an 8-0 lead, courtesy of two Chad Frazier bombs, before KW put any points on the score board. Frazier seemed to be keyed up for Rock Your Socks night for Downs Syndrome, as he reached double digits before the end of the period. 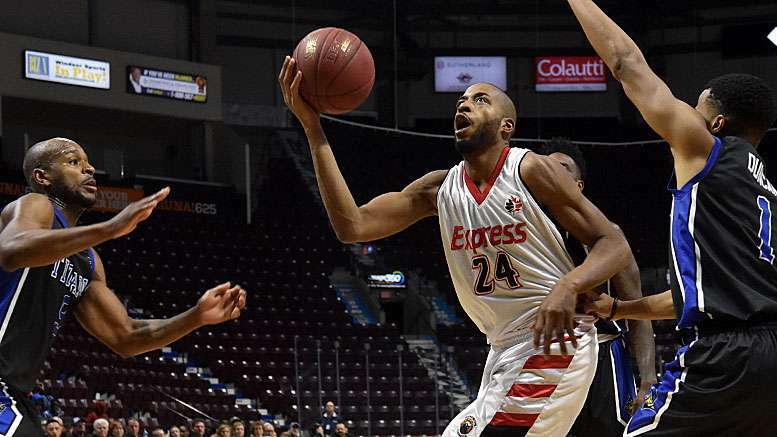 Making his return to the Windsor lineup was Kevin Loiselle, who had been out after crashing to the hardwood in a game against the Saint John Riptide. Loiselle laid up an unhurried 2 points to demonstrate that he was in top playing shape. Also returning from an extended time away was Omar Strong. He was the victim of a cockamamie foul call by the officiating crew, involving Anthony Myles. By the end of the 1st quarter, Windsor enjoyed a 38-29 lead. Frazier led all scorers with 12 points and Logan Stutz wasn’t too far behind with 9. Tramar Sutherland topped the Titans with 8 points. The big difference was Windsor’s 65% shooting from the field, compared to 52.6% by KW. The teams opened the 2nd period with a lot of running back and forth, but little scoring. Missed shots, bad luck, and strong defense, including a pair of blocks, accounted for most of the first 3 minutes. Strong broke the streak with a lazy lob from under the basket. Demontre Harris continued the trend toward scoring with a two-handed put-back off a Shaquille Keith shot. With under 3:00 on the clock, Windsor found themselves a point down to the Titans, who had quietly pushed in front of the Express. The turnaround was partly to do with Windsor giving up too many second chances which were converted by KW. The fans were treated to a head-to-head showdown between former Windsor star Duncan and new kid on the block Maurice Jones. By half time, the line on Duncan included 12 points, 5 boards, and 1 assist while Jones accounted for 6 points, 4 rebounds, and 2 assists. After 24 minutes Windsor clawed back in front and established a 3-point lead, 57-54. KW dropped to 38% shooting, but the real story was the crash and burn by the Express to 25% from the floor. Windsor was saved by 6 points in the 2nd quarter from Keith and 4 by Stutz. Derek Hall was top earner for the Titans with 13 points. Kitchener also scored a big 10 points off of 5 turnovers while Windsor managed just 3 from 4 chances. The teams ran neck and neck during the 3rd period with the lead changing hands 8 times in 12 minutes. Hall exploded in the quarter, knocking down 13 of his total 26 points. Meanwhile, Stutz and Frazier each dropped 18 for Windsor. When the clock wound down, the Express had extended their lead to 4 points, 86-82. After trading points to open the 4th, Braylon Rayson set up strong Strong for a triple from deep in the corner. Strong then dished to Sefton Barrett for a jumped from beyond the arc to create some breathing room. Though KW continued to move the ball well, Windsor was able force them to make low percentage shots. Then Rayson hit for 3 followed by a layup in traffic to put Windsor over the 100-point benchmark. The Titans wouldn’t roll over and scratched their way to staying in the competition. Stutz did his part to keep the Express in the lead with his patented shot put from the low key. With the score 106-98 and just 5:53 to play, the teams broke for a timeout to regroup and discuss stretch strategy. The Titans puled within 3, but Stutz dropped a trey on a dish from Jones. Harris forced in a jam to keep Windsor up by 6, but Duncan dropped a jumper from the paint. A foul by Greg Morrow put Stutz on the line and he hit 1-for-2. Jones tried for a triple from the side court, but rimmed out and managed to grab his own rebound. When he knocked down a jumper KW called a halt to the proceedings. With a 7-point spread Myles found himself under the bucket for an easy 2. However, Keith put a stop to the play by jamming the rock, but committing the foul. Myles went 2-for-2. With a minute left, just 4 points separated the teams. Duncan dropped a triple as the clock ticked down and time ran out before KW could take the shot. The win locked Windsor into the No. 3 seed in the Central Division. They are still mathematically within reach of 1st place and post season home court advantage. Windsor (20-16) are riding a modest 3-game win streak as they prepare for a visit by the London Lightning (23-13) on Sunday. Chasing the Lightning in the standings, the Express are 3 games behind and can move to a single game after a home-and-home series this week. They will need some help from the Titans and PEI in their task. Between the matches with Windsor, London will be in Kitchener on Tuesday and then round out the season April 1 hosting the Island Storm. Windsor closes out the regular season on the road, beginning with a Wednesday meeting with the Lightning. Thursday they travel to St Catharines to face the River Lions before wrapping things up March 31 in Kitchener. The tip this Sunday is at 2pm.